Ross Taylor is looking forward to making his home debut for Nottinghamshire in Friday’s Specsavers County Championship match against Hampshire at Trent Bridge. With his new side having been on the road for their first three encounters, Taylor has had ample opportunity to get to know his new team-mates and he likes what he’s seen – with two wins, in Manchester and Worcester, firing the Division One newcomers to the top of the early-season table. The 34-year old New Zealand international, who has had previous county engagements with both Durham and Sussex, admitted that he’s enjoyed watching the Notts attack in action this season. “There’s still a long way to go in this campaign but the bowlers have been absolutely outstanding,” he said. As a member of the catching cordon Taylor admitted that no-one can afford to rest up in the slips as every ball has looked like taking a wicket. Whilst Notts have enjoyed success on the road, Taylor understands that his team-mates are ready to return home. “It’s been a great start and I’m sure we’d have taken 45 points from our first three matches but now we’ve got a tough game coming up against Hampshire at home,” he added. And after bowling first in every fixture, Taylor anticipates what may happen when Hampshire are the visitors this week – giving their captain James Vince the right to bowl first without a toss. “It’ll be interesting with this toss rule whether we need to put the pads on straightaway on Friday. Taylor’s previous experiences of playing at Trent Bridge are minimal, his one Test appearance on the ground came a decade ago. 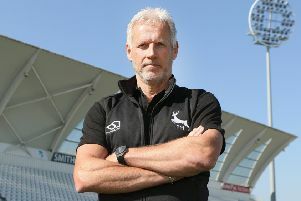 Half centuries in the matches at Emerald Headingley and Blackfinch New Road have already whetted the appetite as to what Taylor might produce for the Nottinghamshire cause, with the batsman eager to praise his new head coach. “I felt rusty and tired in that first match against Lancashire but I’ve worked hard on my game in the nets before the last two games and picked the brains of Mooresy (Peter Moores) and the other batsmen. Hampshire are third in the table, 10 points behind Notts having followed an opening win against Worcestershire with a defeat against Surrey at the Kia Oval and then a rain-ruined draw at home to Essex – and their batting line-up has been strengthened by the signing of Hashim Amla, the South African who had a stint at Trent Bridge in 2010. Nottinghamshire play Hampshire in the Specsavers County Championship at Trent Bridge from Friday 4 May 2018.